This week I decided to go into the liquor cabinet and review a spirit that we’ve had at-least 3 or 4 requests for in the past few months. 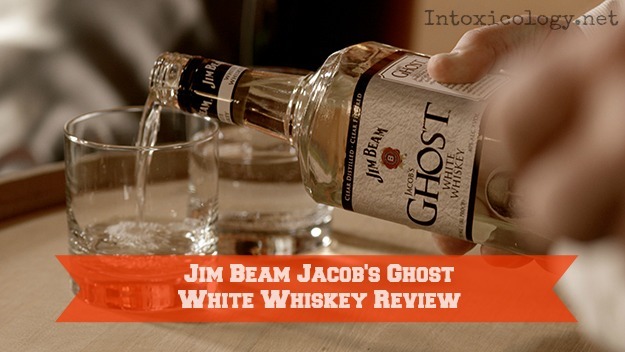 So we’ll be reviewing Jim Beam Jacob’s Ghost White Whiskey and I’ll be honest we’ve had a sample for almost a year now and we never cracked it open. I’ve never been a fan of the white whiskey craze and to this day I still don’t get it. Let’s call this what it is. White whiskey is a “sneaky” cool way for brands to get out their product faster. Bypassing the aged process allows brands to offset some of the time it takes before they have a sellable aged whiskey. For a brand like Beam it allows one of the “big boy” distillers to compete with the “trendy” craft distilleries because quietly (not really) that’s where the trend picked up. Un-aged spirits are essentially a cheaper way to get drunk but now with so many brands playing in the space it’s being taken a lot more seriously. First Impression: My first impression was pretty skewed, I mean I drank with a ghost at midnight. But setting that aside it’s your typical Jim Beam bottle with a slightly altered package to embrace the “white lightning” theme. The color of the liquid ironically isn’t actually white, it’s got a yellow tint to it, almost like dirty water. Tasting Notes: When I sipped this I was pretty surprised. Most of the impressions I got from white whiskies both in past experiences and general stereotypes don’t apply here. You don’t cringe your jaws at the harshness of the whiskey here, Jacob’s Ghost is actually pretty mellow and goes down easy. There’s definitely a sweeter taste to this one too, almost like a vanilla with a taste of grains that remind me of cereal. It’s a step above the white dogs you’ve maybe had that tasted more like someone melted down some veggies. Final Word: I think part of the reason I was a skeptic was my first few experiences with white whiskies were pretty bad. I mean we tasted an awesome local brand here in Orlando from Winter Park Distillery called Bear Gully, but other than that everything else was CRAP. Jacobs Ghost surprised me with a really nice flavor that makes it a great stand in for vodka cocktails or a good bridge of the gap for those vodka lovers not quite ready to jump into whiskey drinks. At 21.99 it’s a relatively cheap price, but I do have to question how they can charge MORE for this UNAGED whiskey than they do for Jim Beam Classic which takes longer for them to make. Either way, if you’re looking for something new to try this one’s worth a shot.